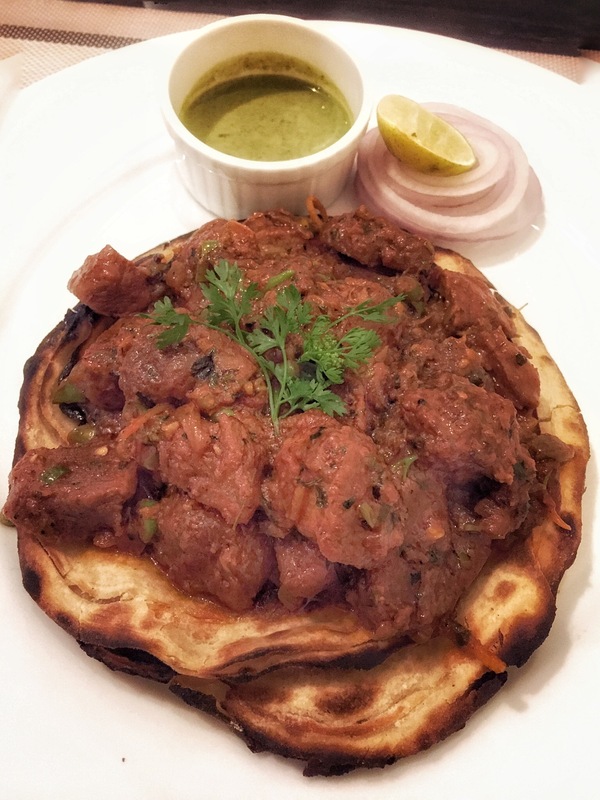 This is a serving of succulent intensely marinated mutton pieces with a after zing of freshly chopped chillies and herbs which is first slowly steamed in its own juices and then slightly grilled before the marinade is added. It’s accompanied by ‘green chutney- a spicy mint based sauce’ with some freshly chopped onions and lime for that extra tang. ‘Roti’- derived from the Sanskrit word ‘Rotika’ meaning ‘bread’ is a standard flat bread made from stoneground wholemeal flour widely consumed in the Indian subcontinent. It’s layered and has a flaky crunch after taste of burnt embers eminating from the crust leaving you for more. It is said no one can eat only one when freshly pulled out from the ‘tandoor’ -Indian baking oven with coals’. A normal Indian household has this as mostly an occasion celebratory meal. This dish prepared is a fusion blend presentation which could be deciphered and eaten as an Indian pizza for less messy rapid consumption or perhaps a wrap like a taco.